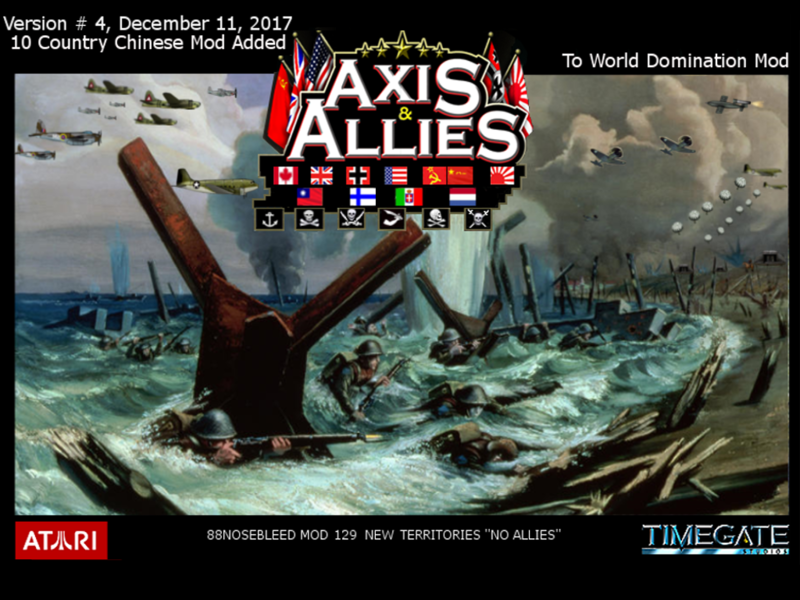 Monday December 11,2017 Axis & Allies RTS 10 Country Chinese Mod Version # 4 Have made many changes and corrections. I have also added 12 more Armies that are available for purchase in WWII and deploy in RTS. I have constructed 11 unreliable infantry armies that cannot be upgraded one for each faction. They will surrender and change sides if attacked and defeated. Thought it might be fun to have other faction armies fight for you on the offensive. Also have added Cavalry to CPC which can also be purchased in WWII. You will still need the Forgotten Combatants Skin files if you have already downloaded it you will be fine. Simply install the A&A folder in My Documents, Re-name any other A&A folders that may be there. Have made many changes and corrections. I have also added 12 more Armies that are available for purchase in WWII and deploy in RTS. faction. They will surrender and change sides if attacked and defeated. Thought it might be fun to have other faction armies fight for you on the offensive. Also have added Cavalry to CPC which can also be purchased in WWII. folders that may be there. it's nice to see that you're still modding the game. the idea of armies that can be captured sounds fun. I take it that you simply made it so that the mobile armies are captured instead of destroyed in the event of a defeat? Yeah I still get brilliant ideas here and there then incorporate them into the game. Wish I had more time to do things. There are a lot of files I would like to change. That's correct if they are attacked and defeated they will change sides. If they launch an attack and are defeated they will be destroyed like the other armies. If you have Mechanized support, Armor support or Air support when launching an attack into a territory the captured armies will also have those properties available to them. Makes things a little more interesting. Can I deploy Breakthrough and SS in the HQ Corps (When I playing as Germans) in custom or campaign? I see AI players can do that. When playing random maps and some custom maps the GER SS, SS Cav, Breakthrough Infantry and certain airfields will deploy from the Oil Depot, the other factions will also deploy Breakthrough Infantry, Cavalry and certain airfields from the Oil Depot in random maps and some custom maps. It was an AI secret. In WWII you must purchase the SS or Breakthrough Infantry in order to have them available. I am starting to find bugs on some of my Islands on the version I am modding now, and they are tough fighters.